A high-powered team of scientific experts from the European Commission will visit India in September to check measures put in place by the country in order to help lift the EU ban on the import of Indian mangoes. This was confirmed to Indian-origin Labour MP Keith Vaz, who visited Brussels on Wednesday and met Dacian Ciolos, EU Commissioner for Agriculture, and other senior officials. Vaz has been spearheading the British Parliament campaign to get the ban overturned. He invited the Commissioners for Agriculture and Trade to visit India to discuss these issues face to face with the Indian government. 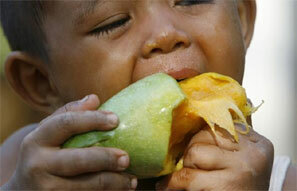 "Indian mango growers are suffering daily and some have been bankrupted as a result of this unfair and illogical ban. British businesses have lost millions. India had only had 37 interceptions of its mangoes in 2013, whereas Pakistan had 136 interceptions and the Dominican Republic had 46 in the same year. It is not clear why India has been picked on in this way," Vaz said in a statement. "What is essential is that the visit of the delegation is a success and that when they come they are fully satisfied that all issues are addressed. To keep this ban going to December 2015 would cause irreparable damage to the EU-India relationship," he warned. The EU's "temporary ban", supported by DeFRA, came into force on May 1 and was to remain effective until December 2015 after authorities in Brussels found consignments infested with fruit flies that they feared could damage European salad crops. Vaz said that the election of the new Indian government under Narendra Modi serves as the perfect occasion to put right this wrong. Minister David Cameron to ask that British officials go to India to help with ensuring that all outstanding matters have been dealt with before the delegation arrives," he said.